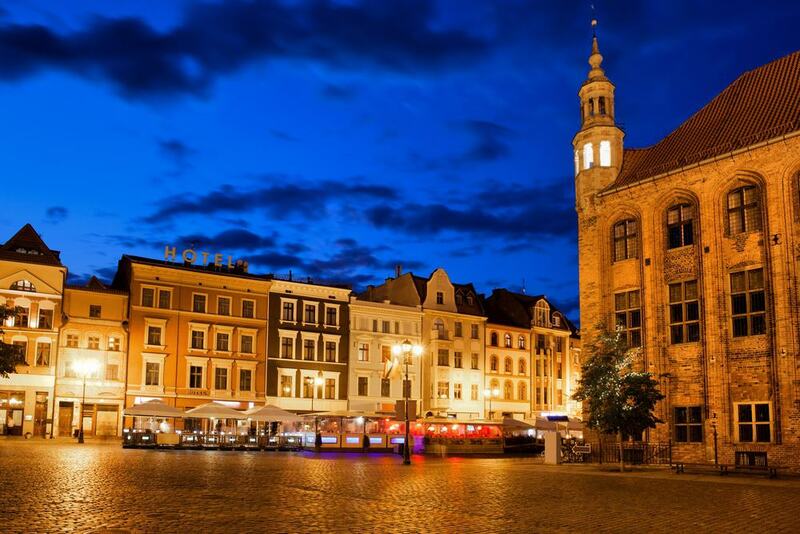 Shielded by walls and gates on the right bank of the Vistula, Toruń is the brick-built city that gave the world Nicolaus Copernicus. The man who put the sun at the centre of the solar system was born here in 1473, and the cathedral still has the very font in which he was baptised. 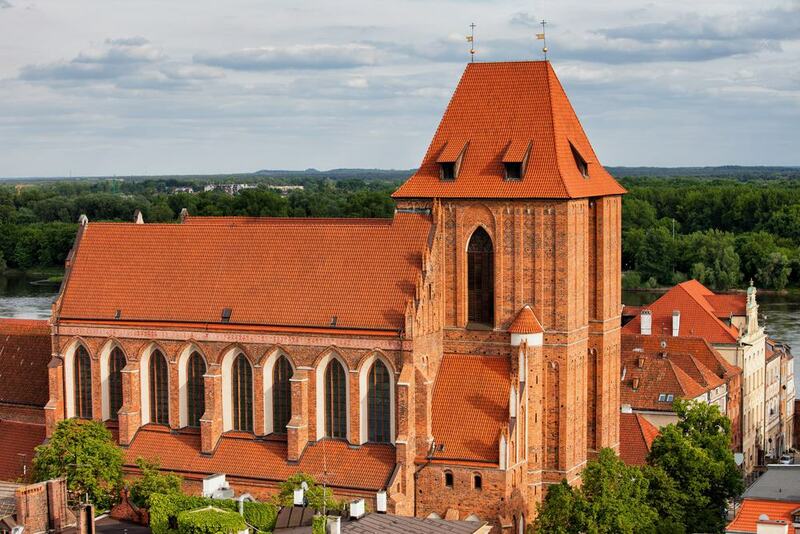 There’s no lack of sights around Toruń relating to this illustrious son, but the city has more to keep you engrossed. Toruń was founded by the Teutonic Knights, and when their castle was excavated in the 1960s it revealed hidden underground chambers. 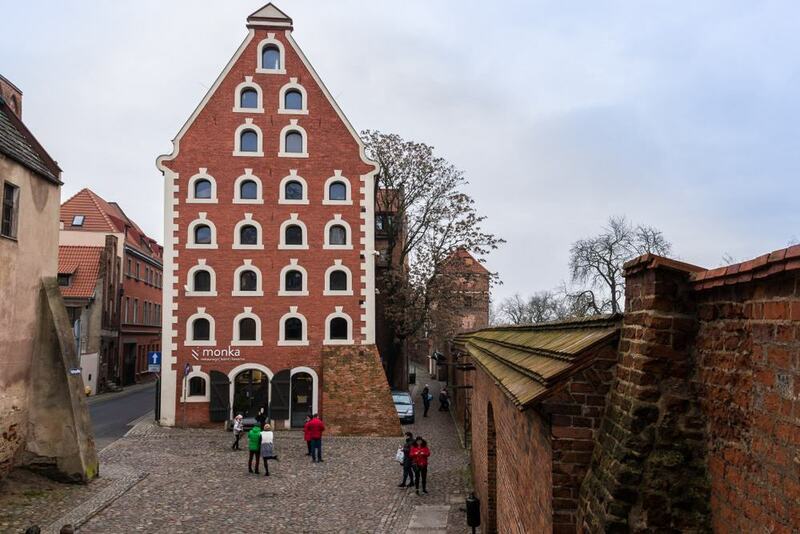 In the Middle Ages the city was also part of the Europe-spanning Hanseatic League, and many of its merchant houses and historic granaries are holdovers from when trade was booming in the 14th and 15th centuries. One of the greatest pieces of secular Medieval architecture in Europe, Toruń’s Old Town Hall grabs all the headlines. It goes back to the middle of the 13th century, but the lasting work was done in the 1390s under the watch of the Teutonic Great Master, Konrad von Wallenrode. 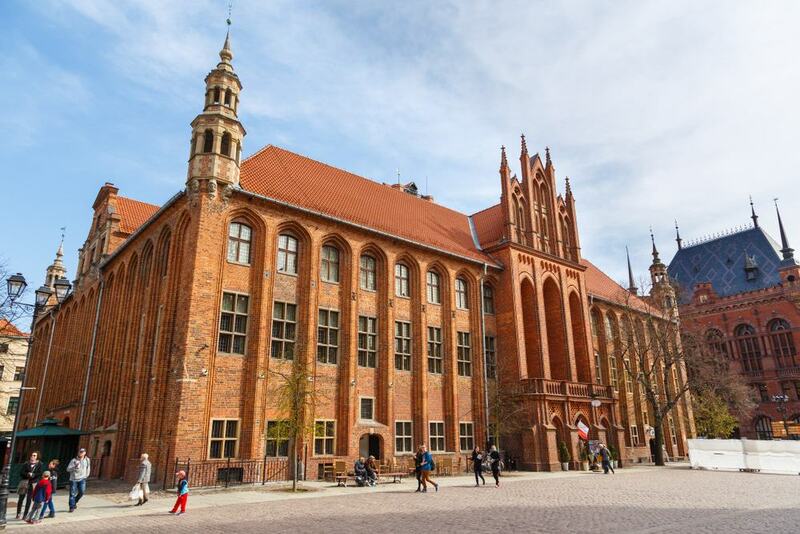 At this time Toruń was at its apogee as a Hanseatic city and the Town Halls size and grandeur reflects that confidence. In those times the ground floor and courtyard were allocated for traders, while government decisions were made on the level above. As we see it today, the Old Town Hall has Mannerist architecture following a makeover at the start of the 17th century. There’s a museum on the history of the city inside, and you can battle up the steps to the top of the tower, the oldest part of the building, for a knockout view of the Old Town. 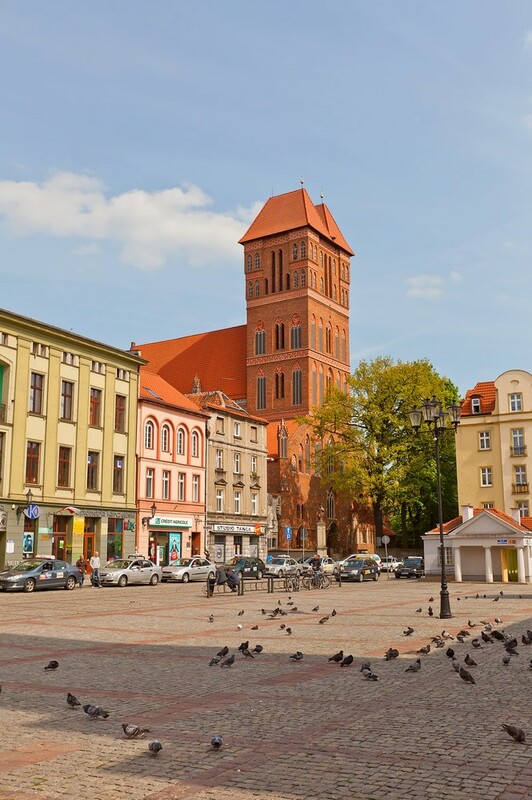 Where it all began, Toruń’s fabulous central square was marked out between 1252 and 1259. In Medieval times, tournaments took place along the western frontage, and people were executed and punished at the pillory. The remarkable town hall takes all the plaudits, but you shouldn’t neglect the historic townhouses for merchants and nobility, and a few of the other smaller sights on the square. One is the Artus Court, once the heart of social and political life for merchants in the Teutonic City, now with a Neo-Renaissance facade from the end of the 19th century. Then at no. 26 is the handsome Main Post Office, built in the 1880s in the days of the German Empire, with a Neo-Renaissance gable to complement the Town Hall. Coming face to face with this Late Gothic wonder on Ulica żeglarska, it’s hard not to be awed by the mighty western tower. If you’re keen on Medieval history you’ll want to go slowly as the cathedral has masses of art and historical monuments. As a priority you have to see the frescoes in the chancel dating to the 14th century and showing the Crucifixion and Last Judgment. On the Copernicus theme, in a chapel dedicated to the astronomer is a 13th-century font used for his baptism in 1473, as well as an 18th-century bust and a tomb monument. Up in the tower you can see Tuba Dei (God’s Trumpet), Poland’s largest medieval bell, weighing nearly 7.5 tons and cast in 1500. When you remember it was sacked in 1454 during an uprising against the Teutonic Order, it’s not surprising that little remains of the old Teutonic Castle east of the Old Town. The site had been mostly forgotten until the 1960s when excavations brought to light underground chambers that have been opened up to visitors. You can enter the kitchen and learn about the knights’ diet and see what would have been kept in the pantry on a typical day. Other things to discover are the dormitory, where information boards inform you about the order’s daily routine, as well as the restored vaults and the active minting room in the castle’s bailey. In the ruins of the old chapel there’s also a set of replica siege engines. In an early-19th-century granary in the Old Town is a working reconstruction of a Renaissance bakery. At this setting you’ll get to see, and take part in, the traditional method of making gingerbread. That will entail sifting flour and measuring spices, and then baking the dough in old-school wooden forms. All the way you’ll hear fascinating insights and no shortage of jokes from the gingerbread master, apprentices and a witch, finishing up with your own piece of gingerbread to take home. In 2014 a new exhibition opened, showing how gingerbread-making became industrialised at the turn of the 20th-century with a set of original German machines and moulds. Of all the monuments facing the Old Town Square, this Italianate Baroque house may be the most beguiling. The building is far older than its 17th-century facade, having been put up in the 1200s. Later, it was home to the Italian humanist and writer Filippo Buonaccorsi, tutor to the sons of King Casimir IV Jagiellon towards the end of the 15th century. 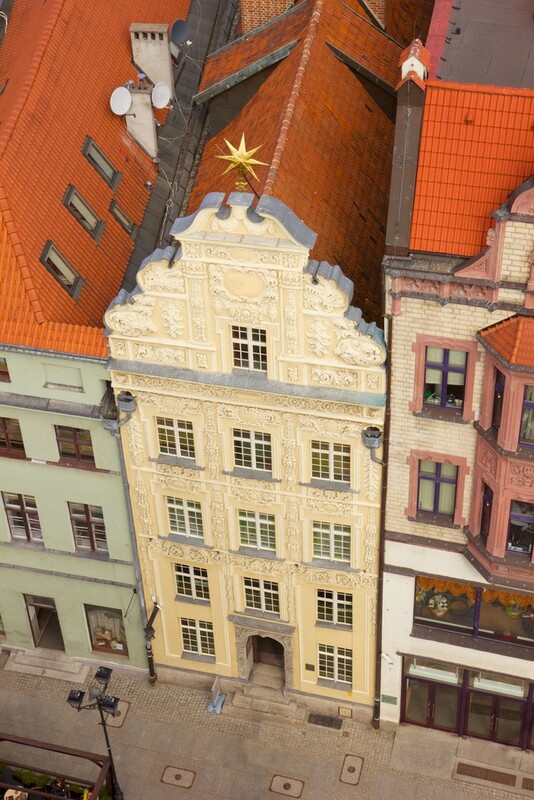 But that detailed stuccowork, with a fruit and flower motif is from 1697, and the building’s name comes from the golden star atop the gable on the facade that was placed here during this redesign. The interiors, with richly carved wooden stairs and painted ceiling beams, are just as they were in the 18th century. Also in store is a sensational collection of painting, sculpture and applied arts from China, India, Japan, Vietnam and Korea. If you need a place to meet up in Toruń look no further than the statue of Nicolaus Copernicus in front of the Town Hall, high above the cafe tables. On a five-metre pedestal, he stands at twice life size and is dressed in academic attire. In his left hand you’ll notice he’s holding an astrolabe, while, for obvious reasons, his right index finger points to the heavens. The monument was raised in 1853 after more than 14 years of fundraising and preparations. On the pedestal is an inscription by the German polymath Alexander von Humboldt, reading, “Nicolaus Copernicus Thorunensis, terrae motor, solis caelique stator” (“Nicolaus Copernicus of Thorun, mover of the earth, stopper of the sun and heavens”. In a city as old as Toruń “new” is a relative term, as this square was laid out in 1264 near the eastern end of the Old Town. Once the centre of a separate town, the New Town Square had its own town hall, which lost its status when the two town’s merged in the 15th century and was pulled down in the 1800s. Considering its age there’s a real sense of scale on the New Town Square, which measures 95 x 95 metres and is enclosed on all sides by the beautiful facades of townhouses. These are in a mixture of styles, from Gothic to Renaissance, Baroque and Neoclassical. At no. 17 on the north side and no. 8 on the west side are two handsome Baroque townhouses, both former inns with interiors going back to the 15th century. 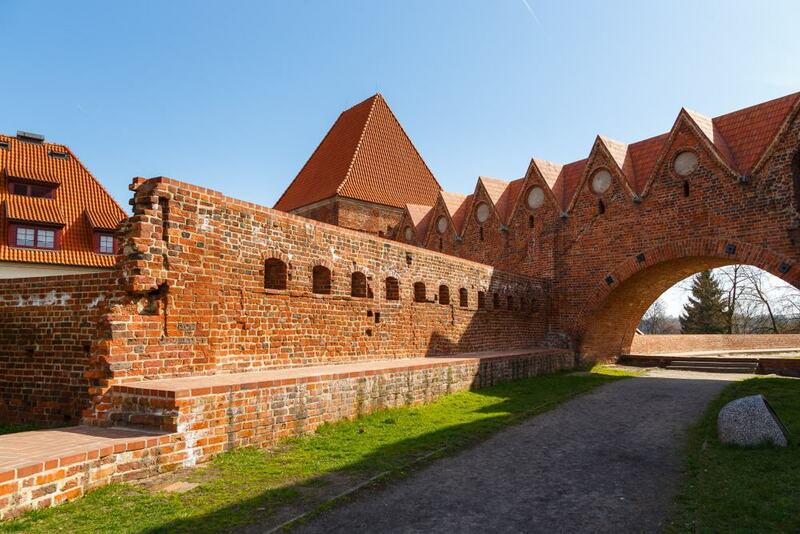 Toruń’s walls are as old as the city, dating back to the middle of the 13th century. As the city grew in the Late Middle Ages, these were also extended and reinforced. Some big chunks have been preserved, and there are nine gates and towers still standing. The most complete section extends for 100 metres or so along the Vistual Waterfront, beginning in the west at the Leaning Tower, which we’ll talk about next. After a short walk you’ll arrive at the Brama Mostowa (Bridge Gate), first raised in 1432 and with an ogival portal beneath it. The name comes from a wooden bridge that once crossed the river at this point. From roughly the same period is the imposing Brama Klasztorna (Convent Gate), which has Flemish Gothic architecture and stands at five storeys tall. In the southwest corner of Toruń’s Medieval defences is a tower that is more than a little askew. 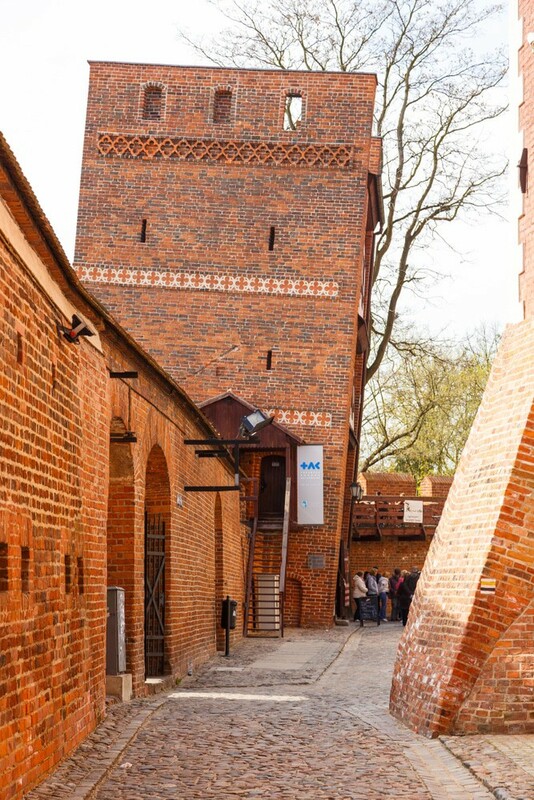 Made of red brick in the late 13th century, the building has a 1.46-metre tilt away from the river, causing it to hang over the street below. Now hosting a tavern, the Leaning Tower would have started to tilt as soon as it was constructed as it was built on unstable loamy soil. And as you’d imagine there are a legends around the building. One playful story goes that the tower used to be friends with the Vistula, so the river got closer to it. But as the river came closer, it started eroding the walls. And when the tower pleaded with the river not to get too close because it might fall, the river shouted, “So fall down, then!”, or “Toruń” in Polish. This shout echoed across the landscape and was heard by people travelling past the city, and that’s how it ended up on maps. 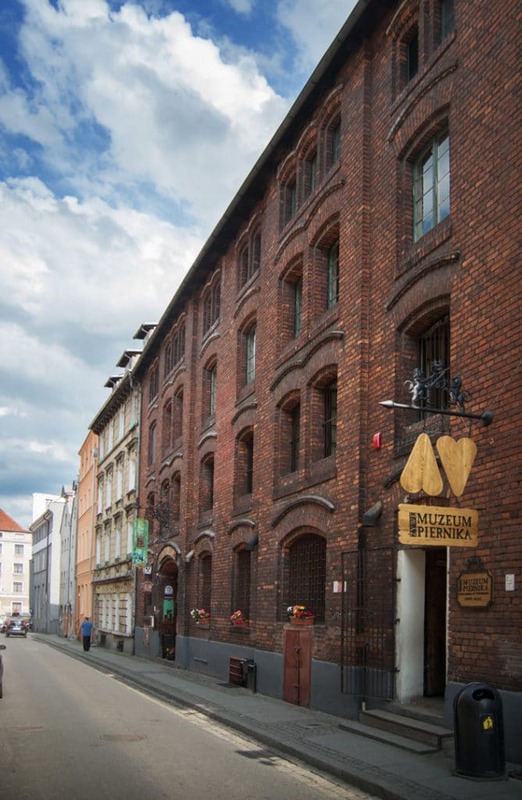 The many granaries on Toruń’s streets are a clear indication of the city’s Medieval power. These Gothic structures go back to when the city was a member of the Hanseatic League from the 13th to the 15th centuries. There are 30 granaries remaining, down from almost 100 when the city was at the peak of its powers, and these have been mostly adapted as homes. You can distinguish them from Toruń’s tenement houses by the densely rowed semi-circular openings in their walls. For the best examples head to Ulica Rabiańska, Ulica Mostowa and Ulica Ciasna. Another fitting homage to Copernicus is on the western fringe of the Old Town, beside the university’s Harmonica building. Designed by the local artist Zbigniew Mikielewicz, this fountain was switched on in 2008 and took inspiration from Copernicus’ seminal work “On the Revolutions of the Heavenly Spheres”. Shooting through a granite base are 113 jets, plotting the orbits of the planets, Mercury, Venus, Earth, Mars, Jupiter and Saturn. These are fixed around the tallest central jet, five metres high and representing the sun. 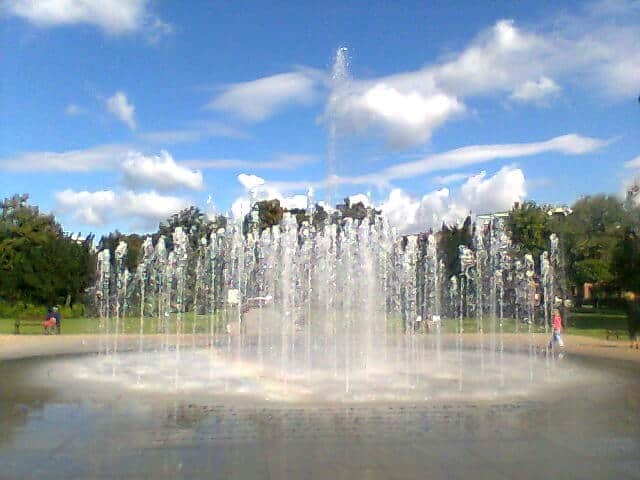 In summer the fountain puts on four light and sound shows from 21:00 to 00:00. These are soundtracked by a score written especially for the monument by the composer Krzesimir Dębski, as well as themes from the movies Gladiator and Love Story. As you’re in the town where Copernicus was born it’s only right to spend a little while pondering the cosmos. The Planetarium opened in 1994 and is set in a converted Gothic Revival gasholder dating back to 1860. You can watch five English-language shows here, on topics like the Solar System and the biggest known objects in the universe. 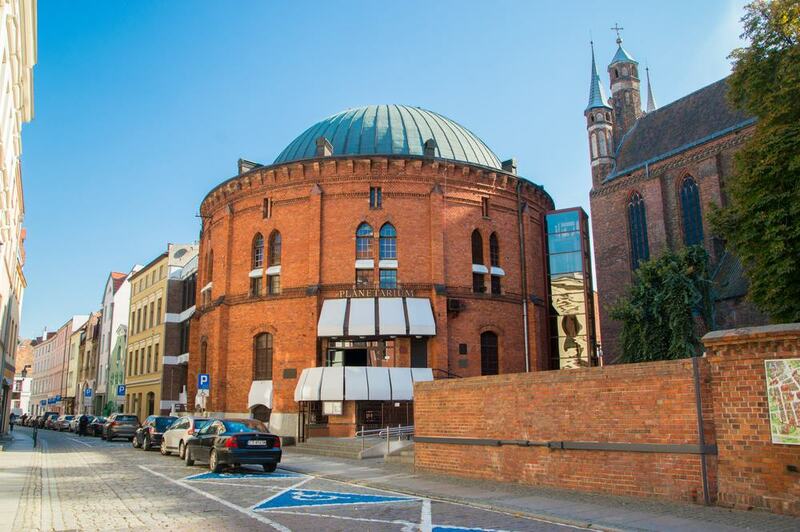 The Planetarium’s state-of the-art projector was manufactured by the German optics brand Zeiss and projects its images onto a 15-diameter dome, one of the largest in Poland. On the ground floor of the building is the Orbitarium, all about the Cassini mission, which beamed back images of Saturn ten years ago and landed the Huygens probe on one of its moons, Titan. Staying on the right bank of the Vistula it’s worth taking some time to poke around the quarter that borders the Old Town to the west. Once a suburb, and now in the middle of the city, Bydgoskie Przedmieście cropped up on the fringes of the City Park when Toruń was flourishing at the end of the 19th century. 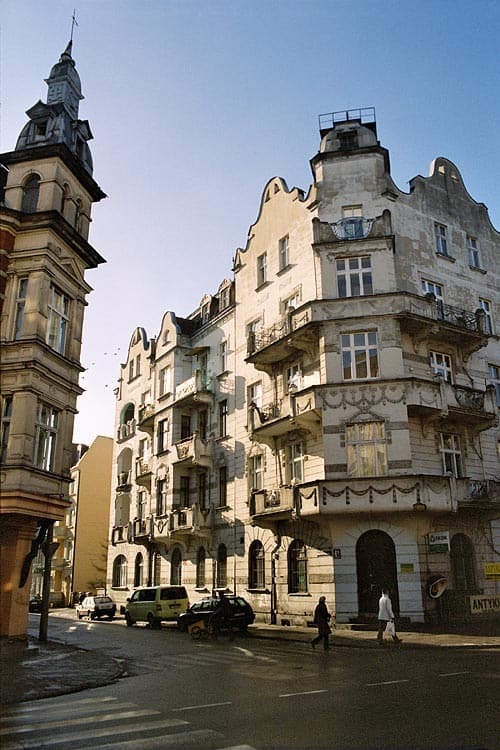 Aside from the Old Town this is now the quarter of the city with the most listed monuments, all in the form of graceful Art Nouveau tenement houses, restored after decades of neglect during the Polish People’s Republic. A good place to start is Ulica Bydgoska, continuing down Mickiewicza and Chopin. Before completing the loop and returning to the Old Town you could wander through the City Park, which has a zoo and botanical garden. 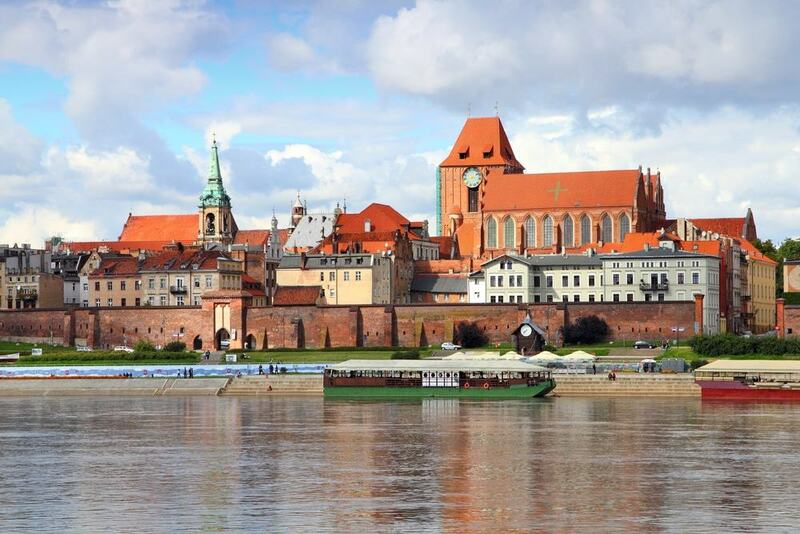 To see Toruń’s silhouette in all its majesty you’ll actually have to cross the Vistula River. At Ulica Majdany on the left bank is an observation platform at the start of the lost bridge spanning the Vistula to the Bridge Gate. The platform is slightly raised, and shows Toruń and its epic cathedral in silhouette, rising behind its walls. You can also make out the remnants of the Teutonic castle, the old granaries, the tower of the Old Town Hall and a few gables from burgher and patrician houses. After sunset the scene is very Romantic when the wall and monuments within are illuminated and reflected in the Vistula.